The Teruel Power Station of Endesa S.A. is situated roughly between Madrid and Barcelona, about 100 km southeast of the city of Zaragoza. This rugged part of Spain is a finding place for lignite and the power station is located near several large mines. The lignite is a low cost, abundant fuel and the Teruel Power Station, with its installed capacity of 3 x 350 MW, is used by Endesa as a base load plant. The lignite from the local mines has a sulfur content of up to 7 % and a low heating value. A variable portion of imported coal is mixed into the lignite to obtain a fuel mix with a nominal sulfur content of 4,5%. In 1992, Endesa decided to retrofit wet desulphurisation plants to all three units of the Teruel Power Station. After considering different options, Endesa selected a Mitsubishi (MHI) wet limestone FGD process. When in operation, this will be one of the world’s largest FGD plants in terms of SO₂ removal capacity. A number of different options were also considered for the treatment and routing of the desulphurized gas streams coming out of the FGD absorbers. After considering all the environmental, operational and financial arguments, Endesa decided to continue the use of the existing, 343 m high chimney. Endesa also decided that the flue gas should be reheated to at least 75 °C. The method chosen for reheating is the injection of hot air from the air preheaters into the desulphurized gas stream, at a point directly behind the FGD absorbers. 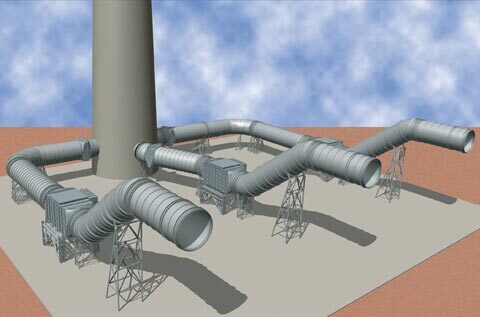 The FGD outlet ducts will be exposed to highly corrosive operating conditions and sometimes to a total or partial FGD bypass of the unscrubbed gas stream. The PennguardTM Block Lining System was selected for the internal protection of the three large FGD outlet ducts, which have a combined internal area of 7.035 m². 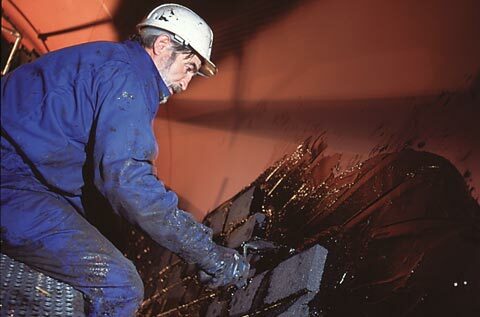 Before the desulphurisation process, the flue gas has an SO₂ content of 18.000 mg/Nm³. The FGD absorbers remove more than 90 % of this SO₂. Then, as the cleaned gas comes out of the absorber into the outlet duct it is mixed with a much smaller stream of hot air coming from the air preheaters and its temperature is raised from a water saturated 60 °C to a much drier 75-85°C. Even after a highly efficient desulphurisation, the flue gas is still extremely corrosive to mild steel. The reason is that SO₃, which causes the formation of acidic condensate in the ductwork, is only partially removed from the gas stream by the wet FGD process. 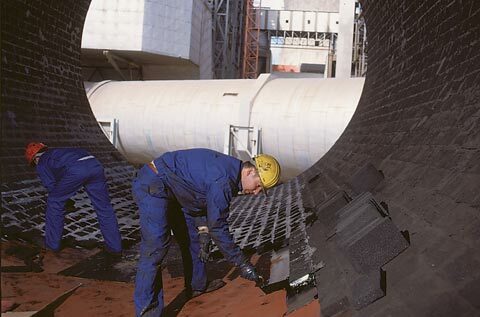 The average SO₃ content for the unscrubbed flue gas in Teruel Power Station is 140 mg/Nm³ and much of this will “slip” through the absorbers into the outlet ducts. The reheating of the scrubbed flue gas by 15-25°C will raise the temperature of the gas stream above its water dewpoint of 60 °C, but it can never raise the temperature above the acid dewpoint. Typically, the acid dewpoint of a flue gas will lie between 120 and 160 °C, depending on the SO₃ and water content of the flue gas. The reheating system will evaporate most of the moisture present in the scrubbed gas stream. Only minor quantities of condensate will remain, but this condensate would be very corrosive to steel and so a highly resistant internal lining is required. The operating conditions in the mixing chamber, where the reheating takes place, are especially corrosive. The selection of a PennguardTM lining for the Teruel FGD outlet ducts was based on its long term reliability and its very low maintenance requirement and also on some of its practical properties. 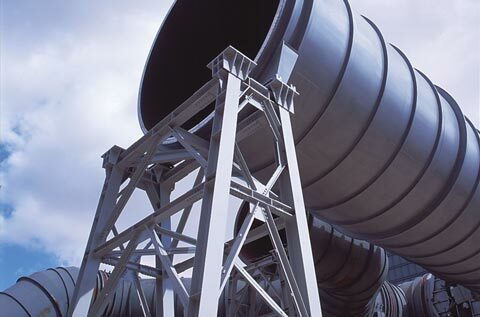 First of all, a number of power stations worldwide that fire high sulfur fuels have gathered positive long term experience using PennguardTM linings in FGD outlet ducts and chimneys. The operating experience shows that even under highly acidic conditions, PennguardTM linings offer an estimated service life of 20 years and require very little maintenance. Furthermore, PennguardTM offers a very practical advantage. A PennguardTM lining provides excellent thermal insulation and keeps the external surface of a flue gas duct at a cool, nearly ambient temperature. In the Teruel FGD project, the use of a PennguardTM lining therefore eliminated the need for external insulation, leading to a savings in engineering, construction and future maintenance costs. 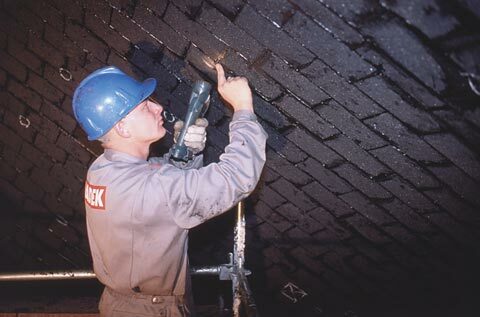 The application of PennguardTM linings to the three large outlet ducts was performed between September and December of 1998. 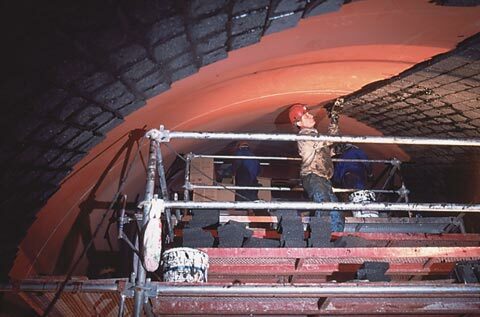 After mounting of the ducts onto their support construction, they were first grit blasted and cleaned, after which the PennguardTM Block Primer was spray applied to the steel surface. Construction details such as flanges of expansion joints and manholes were then protected by 2 mm thick strips of a special corrosion resistant alloy. Special design details had been prepared for this in the planning phase of the project. 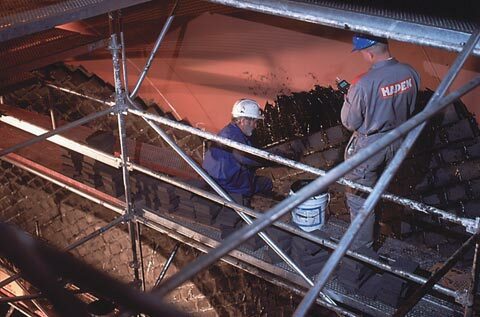 The PennguardTM lining itself was installed by a group of 6-8 Spanish brick layers and the average production rate was around 1,5 m² per applicator per hour. An experienced team of 2 quality inspectors and a site manager, all from Hadek, were present on the project site to train and support the applicators and to monitor the quality of the installed linings. As the “finishing touch”, all floor areas (i.e. 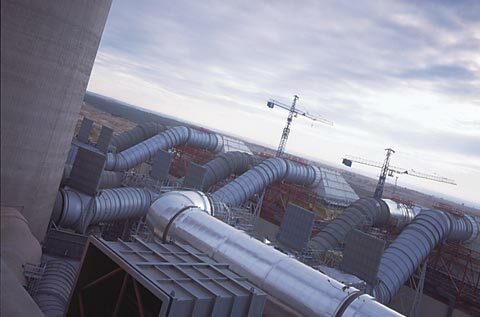 the lower 1/6 of these round ducts) received additional protection from a 30 mm thick layer of Tufchem Silicate Concrete. This special acid resistant concrete is part of the PennguardTM product line. It will protect the PennguardTM lining on the floor from mechanical damage that could potentially occur during cleaning work or other activities. Any questions? You can contact us directly!